For Miranda Prospero, a former member of Eastern Prep’s elite “in-crowd,” life has become boring, but not exactly unbearable. Just recently, the school administration discovered that she and her friends were running a secret matchmaking service that paired up geeks with the academically challenged cool kids (for a price). To save their own skins, her boyfriend and friends produced Miranda as the ringleader of the operation. The school demanded that Miranda pay back all profits she earned from her little business, so at present, she finds herself sentenced to minimum-wage labor at a greasy hotdog stand at the local mall. But things aren’t so bad. She’s managed to make some friends her own age there, including Ariel, her sweet, cheerful manager/co-worker; Colin, a waiter who works in the hell that is Cheeze Monkey Pizzeria; and Caleb, a brooding, frustrating, yet incredibly attractive game-store employee. Shortly after the story’s beginning, Miranda, her new friends, and a handful of other teens (including her now ex-boyfriend and a few other treacherous classmates) get snowed in by a massive blizzard. Since Miranda had planned to throw a surprise birthday party for Ariel, she and her friends unleash the festivities in the mall—and at the same time, take vengeance on her former in-crowd compatriots by increasingly juvenile means (tormenting a girl terrified by rabbits in an elevator with a pet-store bunny; asking Ariel to lure a few “mean girls” into the mall beauty salon and give them bad makeovers.). The fun turns sour, though, once they realize that a dangerous assailant is trapped in the mall with them—someone who steals mall merchandise and then acts violently when someone tries to catch him in the act. 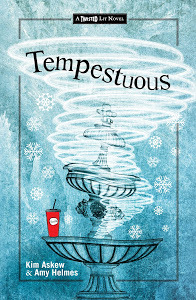 Tempestuous, the first book in a series that plans to focus on putting a “modern-day spin” on Shakespearean literature, centers on the comedic play The Tempest. For those who haven’t read it, Tempest takes place on an enchanted island where Prospero, the bookish, exiled Duke of Milan, now spends his time dabbling in magic. His only companions are his daughter, Miranda; Ariel, his faithful spirit-servant; and Caliban, the crafty, deformed monster-servant intent on betraying him and claiming the island for himself. When a ship carrying the makers of his social undoing—Alonso, king of Naples; Duke Antonio, Prospero’s usurper brother, and others—comes within distance of his island home, Prospero decides that he wants revenge and creates a storm to shipwreck everyone on the island. He then spends the rest of the story leading the castaways through a series of tests to call them out on their past transgressions, leading them to see the error of their ways. He then gets his old job back, and he even manages to arrange a marriage between his daughter and the king’s son, Ferdinand. Tempestuous proves to be a very faithful, if at times, somewhat problematic interpretation of the Bard’s work. In this updated version the authors have combined Prospero, the original magician, and his daughter Miranda to make the story’s hero young and female. Like her literary component, the YA novel’s heroine “works magic” by matchmaking, manipulating situations to her liking, and punishing her enemies— though in her case, it seems like each prank is carried out in a fit of mean-spirited vengeance against clichéd villains rather than with the well-meaning spirit of the Bard’s comedy. This isn’t to say that Miranda herself doesn’t gain some sense of humility in the end, however. As she sheepishly admits at the conclusion of her adventures: “Justice [is] always preferable to petty revenge” (169). Who will enjoy it? I think I can safely say that this book will appeal to shy, young loner-types who feel they don’t fit in, who enjoy a light read on occasion, and who love seeing snooty popular kids reduced to caricatures. Reading The Tempest isn’t required to get the overall gist of the story, but as a former English major, I can’t resist urging those unacquainted with the Bard to rent a copy of it. Recommended for Ages 15-17 for Language. It's great stuff. I get it some new information through your blog. Its really helpful to me.